2000 would see a new official supplier in Puma. With a new supplier we would also get a complete new look and gone completely from the jerseys would be the colour green. The white jersey would be labeled as our home jersey but this was worn away if our red away jersey clashed with the home team. That being said the away jersey was also worn at home so it can cause confusion. OFFICIAL JERSEY - Made by Puma, there would be no variations. 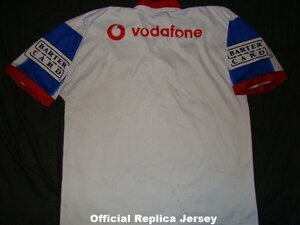 None official anyway and there are fakes of this jersey out there. These jerseys would be the first replica's to feature the straight tongue on the Warriors logo. 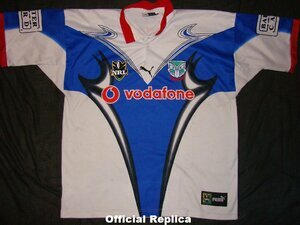 Common jersey that isnt hard to find. 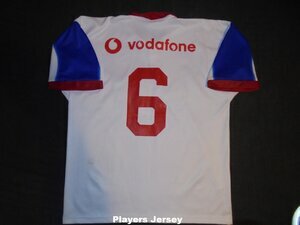 PLAYERS JERSEY - Players jerseys were the same as the replica but didnt have a sublaminated sleeve sponsor and had a red number on the back. Sleeve sponsor Barter Card had large badges sewn on for players jerseys. 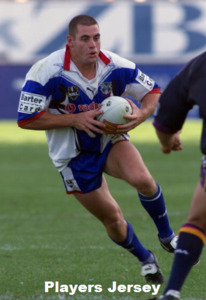 The example in the image gallery has no sleeve badge attached and could be a 2000 or 2001 jersey. Look for the match photo to see what the sleeve badge looked like. 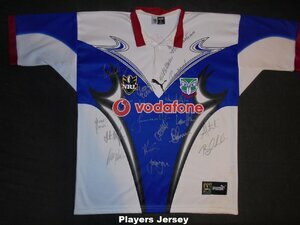 Players jerseys with the Barter Card badge are extremely rare and the example I have seen is in the Mad Butchers collection at Mt Smart.